A few years ago my husband serendipitously ripped a page out of a magazine at his mom's house because he liked the colors of the kitchen in the picture. When we got home I happened to look at the back of the page and found an amazing tutorial for making embroidered portraits from the book The Homemade Home by Sania Pell. I loved the stitched portraits in the tutorial and the whole process seemed like something I could do so I gave it a try. At the time I had been doing a lot of artwork stitching into canvas so instead of using watercolor paper, like in the book, I stitched my portraits onto canvas. Since I made my first stitched portrait about 5 years ago I have made a few different portraits for presents (last year I made portraits of the girls for their grandmothers for mother day.) However I have never made a stitched portrait for us. So a few months ago I started working on a new series of stitched portraits for us. This time making one of each of the members of our family. So far I have only finished the Bee but I am currently working on the others. I hope to display them all together when I finally get around to finishing them. 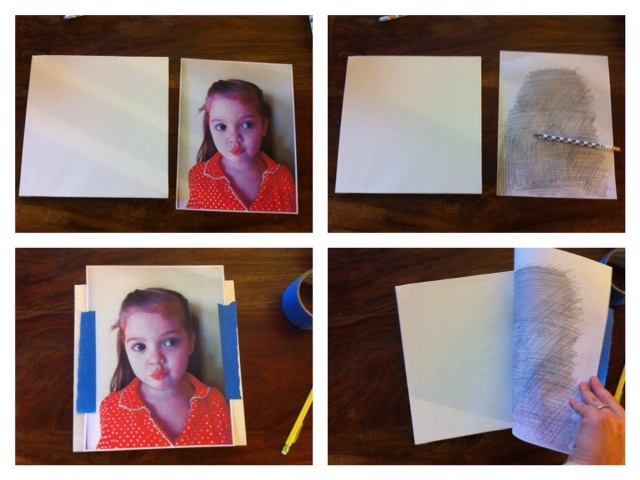 To make the portraits I started with a pre-stretched canvas (which you can get at any art supply store.) I usually try and find the square canvases because I like the way the portraits look on the squares but also because they don't have any cross bracing in the back which makes them easy to stitch into. I then took a photo to make the portrait of. I have found that a close up photo of the head and shoulders with the face straight on works best. Trying to get the clear, close up photos of the girls was probably the hardest part of this whole project but with a little distraction I was able to take a lot photos and get one of each them that worked. I then printed out the photos on paper. While I was working on the photos I also gave the canvas a good coat of acrylic paint and let it dry. I have found painting the canvas is helpful if you get dirt or smudges on the canvas as you are working you can easily touch them up with a little paint. I used a slight off white but I would like to try one with a little color one day. I then took the photo and using a pencil I leaded the back of the portrait (that's fancy for scribbled like crazy until the whole back of the paper was shaded.) Next I laid the photo picture side up on the canvas, where I wanted it to go and taped the edges down with blue painters tape, so as not to mess up the paint. 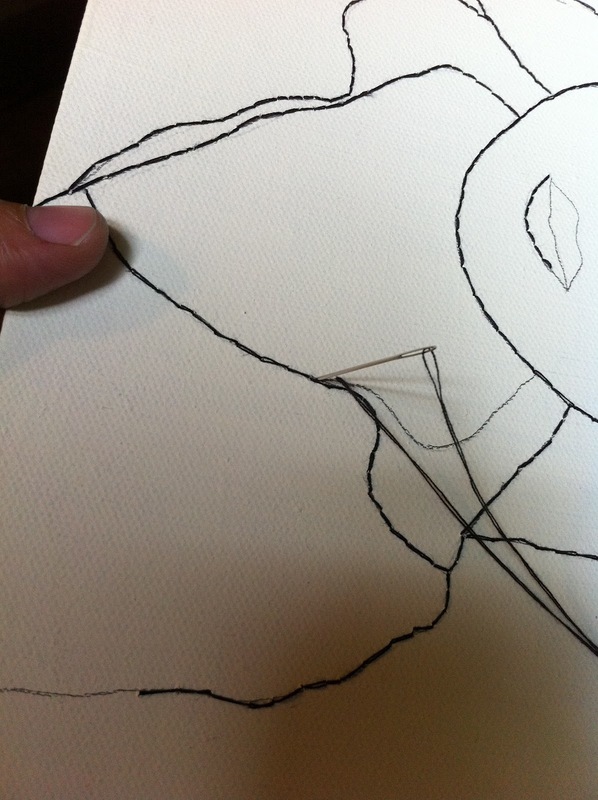 I carefully traced over the lines of the portrait peeling back the edges every so often to make sure the lines were transferring through to the canvas. 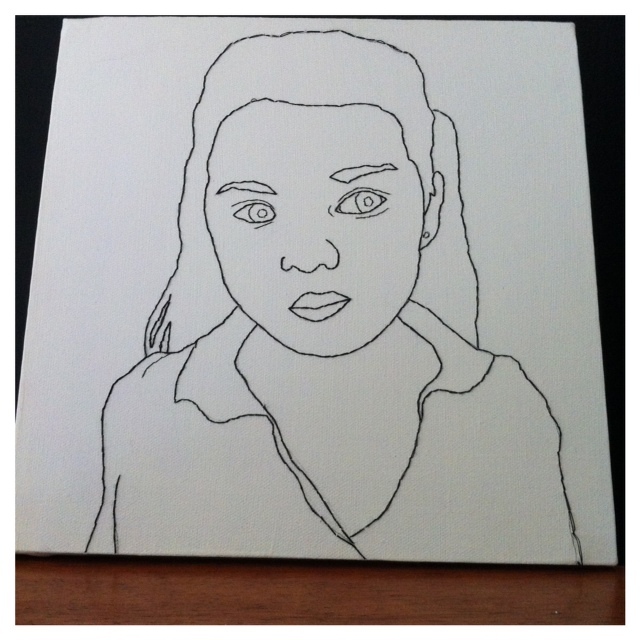 Once I had traced over all the lines on the photo, I took the paper off and was left with a lightly drawn portrait. I traced back over the lines again lightly just to make sure that I could see all the details of the portrait. Then I started stitching over all the lines using a longer quilting needle and black thread. I used a back stitch to make the continuous lines but you could use a running stitch or a combination of stitches. It takes me a while to make each portrait mostly because I don't have a large block of time to just sit and work but if you did you could probably finish the project pretty quickly. I usually work on these sort of projects at night after the kids are in bed, but I have been working on the Bee's portrait some during the day so she can see. She has loved checking in everyday to see how her portrait was going and has been getting a kick out of watching her dad's portrait in progress. I hope to finish up the rest of the portraits in the next few weeks so check back for an update !